This is the band’s second live DVD, the first (“Hope to See Another Day Live”) was produced after their debut album and was probably too early in the career for such an adventure but with four albums under their belt the timing for this release is more appropriate. The band resists repeating any of the songs from the debut, which is understandable, however it’s a surprise that they only opt for one from the album that really set them on their way, ‘Yesterday is a Friend’. The music is quite studious so there’s not a lot of movement from the band but excellent vocalist Karol Wróblewski makes a dramatic entrance on opening track, ‘No Time Inside’. After the instruments establish a fine atmosphere Wróblewski appears in silhouette (Close Encounters….style) singing into a megaphone. As with all the songs on offer this track combines strong melodies with atmospheric soundscapes and excellent musicianship. Marek Gil doesn’t do riffing but his precise and tuneful playing fits the style perfectly. Some would say they rarely get out of second gear, which is a fair observation, with only ‘New Hands’ really upping the tempo. The set list is probably the right length as much more might have meant them overstaying their welcome. 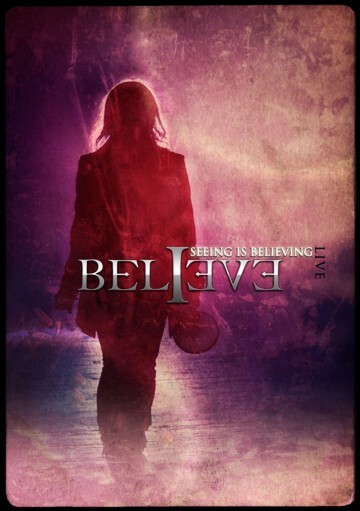 Believe could be lumped in together with any number of other neo-Prog bands but in violinist Satomi they have an element that sets them apart and she provides a delicious aspect to the band’s sound. She combines wonderfully well with Konrad Wantrych’s delightful keyboards, which are a large aspect of the band’s song structures. They do get a bit psychedelic on a couple of occasions which seems at odds with their overall style but for the most part they deliver highly melodic and expressive tunes with Wróblewski’s impassioned vocals. If there’s an odd aspect to this release it has to be the way the audience reaction has been recorded; it sounds as if they were in an empty swimming pool. The extra live footage provides some repetition of songs but does present some additional tunes, although having been recorded by the video camera’s microphone the sound quality is distorted during the heavier sections, which is a shame. In keeping with all the Metal Mind DVDs I’ve seen thus far this is another that gives the featured band the chance to shine and show themselves and their music in a very good light.